For me, the best part of the new addition to the Star Wars series, "The Force Awakens," is its three new heroes. And, contrary to what Tina Turner might have to say on the matter, we need another hero. We almost always do. The movie wastes no time introducing us to two of these new heroes: Poe Dameron (Oscar Isaac), a dashing, x-wing fighter pilot, who is the top-gun of the beleaguered Resistance, and the unlikely FN 2187, a storm trooper serving in the infantry of the evil First Order. We come to know him as Finn (John Boyega). A short while later we meet our third young hero, the beautiful and resourceful, Rey (Daisy Ridley). Rey is stuck in a dead-end job as a parts scavenger on Jakku, a planet that is little more than a junkyard for crashed and abandoned spaceships. We don't learn that much about Poe in this installment of the series. Whatever his backstory is, it remains to be told in future episodes. Rey is easily the most prominent of the new heroes. As the movie unfolds, it is Rey who will be positioned to take up the mantle of Luke Skywalker and begin the proverbial hero's journey, one which will lead her from a solitary life as a scavenger on a desolate planet to become a citizen of the Galaxy and a leader of the Resistance in the struggle against the First Order. But it is everyman Finn who wins my vote for the kind of hero we need most right now. I'll be the first to admit that there's no shortage of heroes on movie screens these days. Superheroes, especially, bound and abound. Endowed with special powers, either at birth or by fateful accident, they fight, often after much kvetching, to save the world, all the while battling inner demons and bickering with their super friends. You could get a movie green-lighted on less of a pitch. Now, it is the case that both Finn and Rey possess special powers. There are hints early on that the Force is strong with both of them. And much of the suspense of the story has to do with whether and when their powers will be revealed. But having superpowers is not what defines the two of them. Instead, their heroism is rooted in character and talent. And, in Finn's case, it is firmly anchored in his sense of common decency. When we first meet Finn in his guise as FN 2187, his face is hidden behind the mask of a storm trooper's helmet and he is kneeling to come to the aid of a fallen comrade whose bloody hand print marks him for us to follow for the rest of the scene. What follows in that scene is a massacre of disarmed villagers by Finn's stormtrooper platoon. Finn's defining act of heroism is saying "no" to participating in this atrocity. Finn does this despite the fact that he understands that his disobedience will lead to his being cast out from the only family he has ever known. He also is aware that his refusal will mark him as a despised traitor who will be hunted down relentlessly by his former First Order comrades-in-arms. But Finn says "no" to killing the prisoners, not because he imagines himself a hero, but simply because saying "no" is the right thing to do. Finn's act of unselfconscious heroism is reminiscent of the stories of the Europeans, many of them Dutch, who saved the lives of Jews seeking refuge during the Holocaust. It is fascinating to watch interviews with these people made long after the war. They appear sometimes genuinely puzzled by the notoriety that has come their way and seldom regard themselves heroes. Quite the contrary, they often protest the designation, saying that they were only doing what conscience demanded, insisting that their deeds were what any right-thinking person would have done under similar circumstances. If only that were the case. This same "ordinariness" is what makes Finn's kind of heroism such a refreshing change. It doesn't originate with his being rocketed away as an infant from some faraway, doomed planet or from a bite from an errant radioactive spider. And his kind of heroism doesn't set him apart from the rest of society like, say, a misfit with a bizarre genetic mutation or an ancient Norse god unwillingly exiled to Earth. Indeed, what makes Finn a hero is not how he transcends his humanity but how, in spite of years of inculcation by his First Order captors, he recovers it. 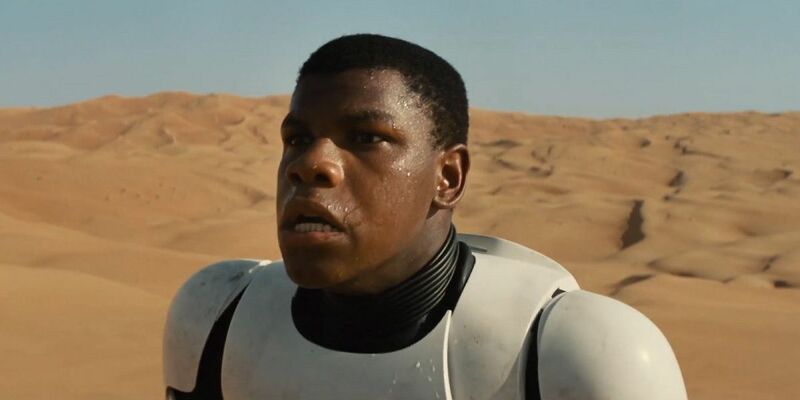 And it is the masterful performance by Boyega that brings Finn's everyman hero convincingly to life. His Finn is unassuming and vulnerable - a veritable ingénue, who casts the shell of storm trooper uniform aside to find himself freshly hatched into a brave, new, uncertain world - but also a person capable unalloyed courage when circumstances demand it. So, to my delight, what we discover with Finn in "The Force Awakens" is, perhaps, the first fully human character of the Star Wars saga. (R2-D2, a droid more human in most respects than his human masters, is the long-standing contender for this title, at least in my opinion.) It is Finn’s humanity that reminds us that real heroism emerges not from super powers or royal birth, but from a compassionate regard for our fellow beings and a willingness to say "no" when the world around us would have us forsake our obligation to their welfare in favor of a life of security and predictability. He is indeed a hero for our time.